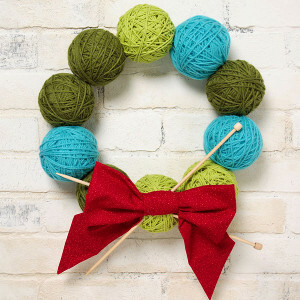 Get the adorable look of a yarn ball wreath without wasting yarn. Instead, use your yarn scraps to make the cutest festive wreath ever. Depending on the colors of yarn used, your Scrappy Yarn Ball Wreath can work for any occasion. Give this darling decoration to your knit-loving grandma or your non-stop-crocheting friend as a sweet gift they'll cherish for years to come. It's a shame to waste any materials, so use your extra yarn and learn how to make a wreath that rocks. STYROFOAM® brand foam - balls (10) - 3"
Wrap foam balls with yarn just to cover foam. Wrap desired amount with desired colors. Add a dab of Quick Dry Tacky Glue to end of yarn then press under yarn. Let dry. Lay finished balls on work surface and form into circle. Determine where one ball touches the next then apply a circle of glue to one ball. Immediately insert toothpick in center of glue circle then press to next ball pressing to secure. Continue gluing remainder of two ball sections. Glue sections together using same method forming wreath. Let dry. To create bow, cut 6” wide and 8” wide strips from lengthwise of fabric. Fold fabric, wrong side together, and overlap about 1” on sides and press. Apply a thin bead of glue along one edge then press other side in place forming a tube. Let dry. Repeat step with other strip. Place tube, right side down on work surface. Fold ends to center overlapping about 1”. Determine correct size for bow and trim ends if needed for desired size. Glue overlap in place. Cut a 4” piece from thinner tube, fold in half and glue edges together. Let dry. Cut a 12” length from thinner strip. Fold over ends at an angle and glue in place. Layer bow on top of strip and pinch together center. Wrap small section around center forming bow. Overlap ends about ½” then glue in place, holding with a pin if needed until dry. Place bow where desired on wreath then apply glue to back of center and press in place. If needed, hold with pins until dry. Insert knitting needles crossed under bow.